Stanley, Laura . "Tanya Tagaq". The Canadian Encyclopedia, 17 October 2018, Historica Canada. https://www.thecanadianencyclopedia.ca/en/article/tanya-tagaq. Accessed 19 April 2019. Tanya Tagaq performs at Globalfest, in Webster Hall, New York City, 2009. Tagaq and her two brothers grew up in Cambridge Bay in a primarily Anglophone household. Her mother is an Inuk	who was raised on Baffin Island, and her father is of British and Polish descent. She endured sexual assaults	and substance abuse throughout her childhood, and attempted suicide while attending a residential school	in Yellowknife at age 15. She completed high school through correspondence in Cambridge Bay and graduated with a degree in fine art from the Nova Scotia College of Art and Design	(one of her oil paintings was selected for the cover of the 2003 NorthwesTel phone book). While living in Halifax in her early 20s, Tagaq received a cassette from her mother of two women throat singing. Though she never intended to become a professional singer, Tagaq developed the throat singing technique by imitating their voices and began performing for friends at parties. In 2000, while showcasing some of her paintings at the Great Northern Arts Festival in Inuvik, Northwest Territories, she sang impromptu at a campfire one night and was asked to perform at the festival. Friends of Icelandic singer Björk saw her performance and Tagaq was later asked by Björk to join her upcoming world tour. Health issues eventually forced Tagaq to quit the tour, but in 2004, Björk asked Tagaq to sing on her album Medúlla. Released in 2005 under the name Tanya Tagaq Gillis, her debut album Sinaa (Inuktitut for “edge”) includes the sensual and beguiling song “Ancestors,” a collaboration with Björk that also appeared on Medúlla. A primarily wordless and instrumentally bare record, Sinaa was nominated for Aboriginal Recording of the Year at the 2006 Juno Awards. It helped Tagaq win Best Female Artist at the 2005 Canadian Aboriginal Music Awards, where it also received awards for Best Producer/Engineer and Best Album Design. In 2006, Tagaq collaborated with the San Francisco-based Kronos Quartet on a song commissioned by Toronto’s Luminato Festival entitled “Nunavut.” The documentary that captures their collaboration, A String Quartet in Her Throat, was nominated for a Leo Award for Best Music Score in a Documentary Program or Series in 2007. In 2015, Tagaq and the Kronos Quartet collaborated with Juno Award-winning composer Derek Charke for the album Tundra Songs. Auk/Blood (2008), Tagaq’s second album, further developed the sounds explored in Sinaa. 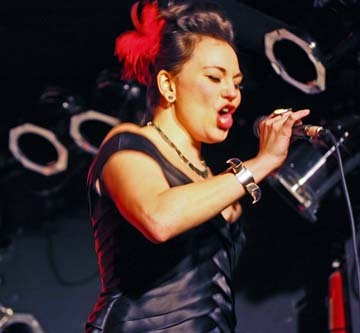 It features diverse collaborations with artists such as Faith No More’s Mike Patton, rapper Buck 65	and Juno Award-winning violinist Jesse Zubot, who would go on to produce Tagaq’s next studio record. Auk/Blood was nominated for Instrumental Album and Aboriginal Recording of the Year at the 2009 Juno Awards, and won Best Album Design at the 2008 Canadian Aboriginal Music Awards. Also in 2009, Tagaq teamed up with filmmakers Félix Lajeunesse and Paul Raphael to create a short film for her song “Tungijuq.” The film won Best Short Drama at the ImagineNATIVE Film + Media Arts Festival in 2009 and Best Multi Media at the Western Canadian Music Awards in 2010. 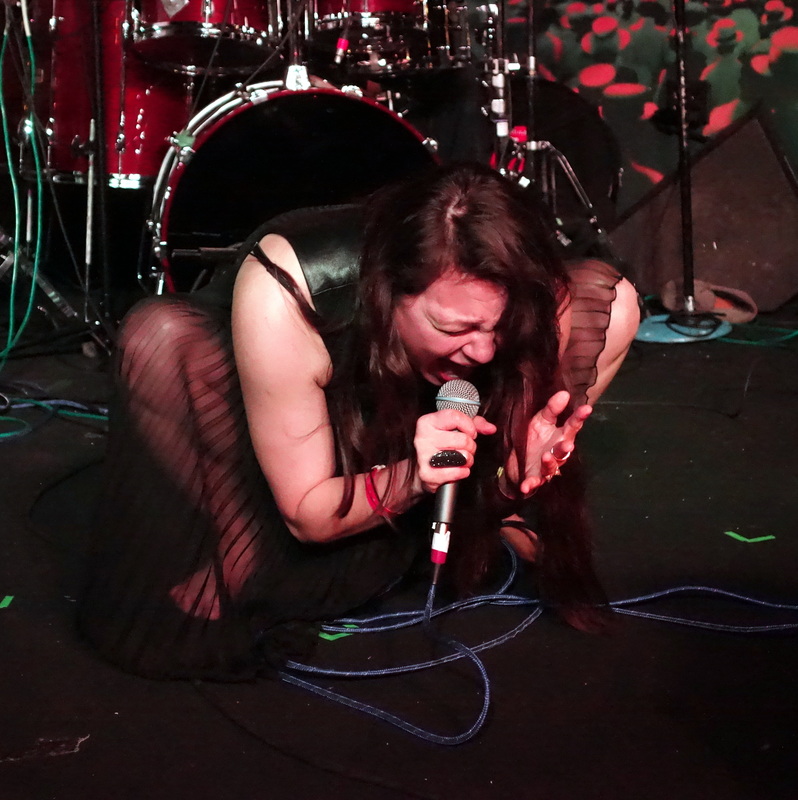 Tanya Tagaq performs at the 2015 SXSW Music, Film, and Interactive Festival in Austin, Texas. In 2011, Tagaq released Anuraaqtuq, a live recording of her improvised performance at the 2010 Festival International de Musique Actuelle de Victoriaville. She was joined by Jesse Zubot and percussionist Jean Martin, who, along with DJ Michael Red, form her backing band. In 2012, Tagaq performed the theme song for the CBC TV series Arctic Air (2012–14), starring Adam Beach. Animism was nominated for Alternative Album of the Year and won Aboriginal Album of the Year at the 2015 Juno Awards, while Zubot received a nomination for Producer of the Year for his work on the album. Animism also won the 2014 Polaris Music Prize, beating out such stars as Drake	and Arcade Fire. Tagaq’s intense and electrifying Polaris Prize performance, which included a scrolling list of 1,200 murdered and missing Indigenous women	in Canada, was met with a standing ovation. Tagaq’s fourth studio album, Retribution, was released on 21 October 2016. Produced by frequent collaborator Jesse Zubot and featuring a track with rapper Shad, the album was met with near universal acclaim. Rolling Stone’s Christopher R. Weingarten called it “her strongest outing yet, shedding practically all of Animism’s tethers to pop structure and mirroring her freer, convulsing, lung-busting, throat-flexing live shows.” Exclaim! magazine’s Sarah Greene agreed that “Tagaq achieves an experience as potent as, and analogous to, her live show,” and called the album “immersive, cathartic, potentially even transformative.” The Guardian’s Ben Beaumont-Thomas called it “a violent and stirring meditation on apocalyptic climate change” and wrote, “Tagaq is riveting, especially when multitracked and given eight or so minutes to range jazzily around art-metal backdrops.” Retribution was longlisted for the 2017 Polaris Music Prize and nominated for a 2018 Juno Award for Alternative Album of the Year. Tagaq’s first novel, Split Tooth, was published by Penguin Random House Canada in October 2018. A cross between fiction and memoir, Split Tooth tells the story of a young girl’s coming of age in Nunavut	in the 1970s. It was drawn from poetry and journal entries that Tagaq wrote over the course of 20 years. Reviewing the book for Quill & Quire	magazine, Carleigh Baker wrote, “Split Tooth is not a book that can be fully absorbed in one sitting. It’s possible to sink deeper and deeper into the narrative with each successive reading. Like a smirking teenager, Split Tooth blithely gives typical literary expectations the finger, daring us to see and experience narrative as chaotic, emotional, and deeply instinctive. And it succeeds.” Split Tooth was one of 12 books longlisted for the prestigious Scotiabank Giller Prize. Tagaq collaborated with composer Christos Hatzis, author Joseph Boyden and the Winnipeg Symphony Orchestra	on the score for the Royal Winnipeg Ballet’s Going Home Star: Truth and Reconciliation (2015), which won a 2017 Juno Award for Classical Album of the Year – Large Ensemble. Tanya Tagaq with frequent collaborator Jesse Zubot, 23 April 2015. Tagaq is a vocal supporter of traditional Inuit sealing. In March 2014, Ellen Degeneres donated $1.5 million to the Humane Society of the United States, an outspoken critic of the Canadian seal hunt. As a counter response, people began posting “sealfies” — pictures of themselves wearing sealskin or eating seal meat. As part of this social media movement, Tagaq posted a picture of her young daughter lying beside a dead seal on Twitter. The image outraged some animal rights activists, who directed online abuse and threats towards Tagaq. “Tanya Tagaq: Anger Management”Read this in-depth profile of Tanya Tagaq from Exclaim! magazine. 10 Things About Tanya TagaqLearn more about Tanya Tagaq with this piece from Toronto’s Indie 88. “Howl: Why Tanya Tagaq Sings”Read this extensive 2015 profile of Tanya Tagaq, from the Walrus. The Indigenous Music RenaissanceRead this CBC Music article on the Indigenous music renaissance in Canada. Official WebsiteVisit Tanya Tagaq’s official website. for her latest news, concert info and more.